Twisted wire, beads, and sea shells - all in one piece! 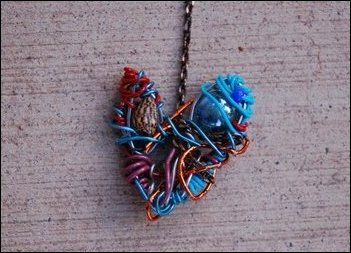 Vivian surely shows off her individualism with her stylish wire jewelry pieces, including rings, pendants, bracelets, and necklaces. She even designed a flirty four layer yellow and green fabric skirt perfect for a night of fun. Lia has soo many cute jewelry pieces that it took a while to choose which to feature. 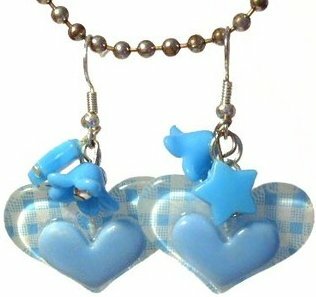 I totally fell in love with these blue gingham heart earrings adorned with flowers and stars, but you'll also want to check out her cupid's bow pink and black mismatched earrings. She has a full section in her shop just for Valentine's Day. Lia also designs hott key chains, phone charms, and wallets. I love her hand-drawn black and white graphic wallets. Love cupcakes, skulls, buttons, and My Little Pony? Then Omglia is the shop for you! Feel free to visit her website at omglia.com. 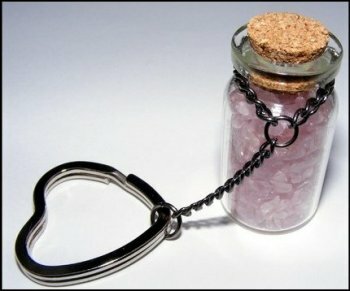 According to Christina, rose quartz is the chakra of heart and the stone of love, so why not give a tiny glass bottle to your love this Valentine's Day? Whether you attach it to your keys or leave it safely on your bedroom shelf, this key chain is an extra special gift to be cherished forever. 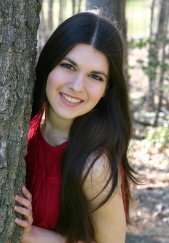 Christina also sells a variety of hair accessories, jewelry pieces, and bookmarks. She even sells bracelets and necklaces for Autism awareness, featuring a puzzle charm, as well as red, yellow, blue, and green beads. All the profits for those specific pieces will go directly to finding a cure, so look stylish and support a great cause! Sweet simplicity! Noelle designs all her pieces using kato polyclay, so it's very strong. 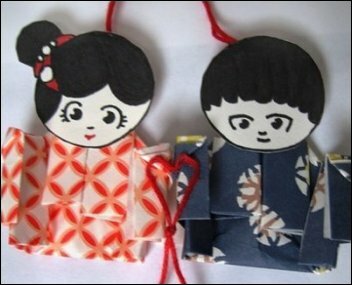 You can also attach this phone charm to your Nintendo DS or Playstation PSP. She creates many other pieces as well, from video game characters to Domo-kun and kitty cats to Christmas hats. She also loves to sew, and runs her online shop with her boyfriend Justin, age 21! Aww, so cute! Guys, buy your gal a Valentine's Day gift that will stay close to her heart all year long by surprising her with this stunning pendant necklace. 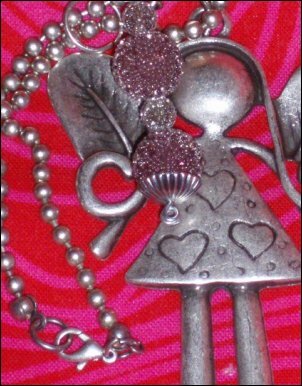 The pendant is of a 3 inch girl with wings, engraved hearts, and four beads, attached to a 35 inch chain. I also love Estefania's "Two Heart Valentine" hand stitched felt piece. She loves to design coffee cozies and headbands, using ribbon and thread among other things. If you're a fan of detail, but maybe don't have the patience for it yourself, you'll love Diana's fabulous beaded jewelry pieces. 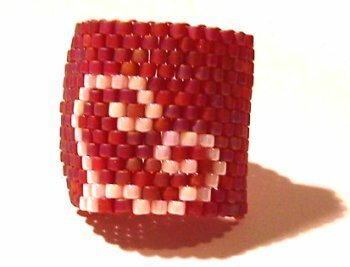 I'm intrigued by her "Snow Beaded Cuff Bracelet", which she made using about 2100 beads and took about 5 hours to make! Or maybe you'd love glamorous mauve, purple, green, and blue Swarovski crystals on a lovely round pendant? I sure do. Diana has a lot of awesome and unique pieces, so definitely take a few minutes to visit her shop. Where else can you get ah-dorable mushroom and octopus erasers?! If you totally love vintage, then this is the shop for you! 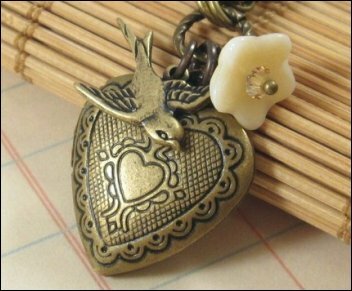 Mia's romantic brass locket necklace with flying bird is adorned with a single creamy glass flower. 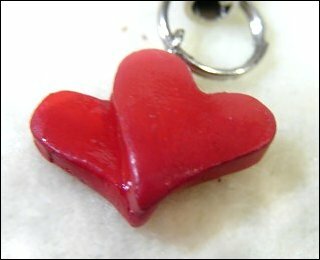 You can see some more stylish heart shaped and round locket necklaces in her shop as well. Mia has a number of flower beaded earrings similar to the one on the locket above, along with hair pins, crystal pendant necklaces, rings, brooches, and lots of other wonderful goodies. You haven't seen it all until you've seen Mia's jewelry! So share the love this February 14th, and give a sweet, handmade gift to your favorite person. They'll cherish it for a lifetime. For more artsy goodness, feel free to read last month's craft feature "Young Artists Get Crafty"